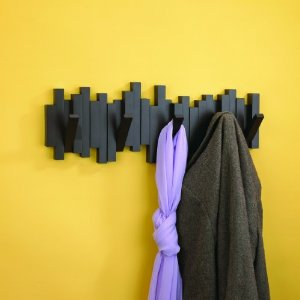 Sculptural and functional, the Sticks wall-mount multi-hook rack from Umbra offers ample storage for coats, bags, accessories and more. Constructed of molded wood with an espresso brown finish, Sticks features five sturdy hooks that flip up when not in use, creating a clean, seamless profile that's great for tight spaces or minimalist decor styles. Unit measures 18 by 7-1/4 by 1-1/4-Inch; concealed mounting hardware is included. Designed by Luciano Lorenzatti for Umbra- the worldwide leader in casual, contemporary and affordable design for the home.